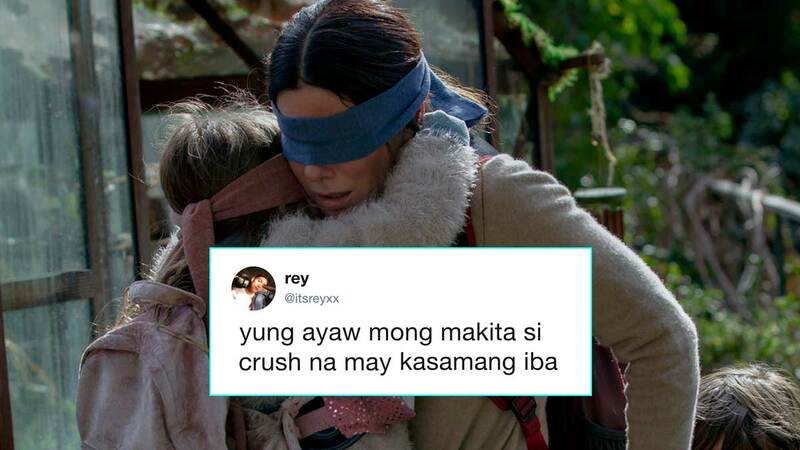 If you haven't watched Bird Box yet, well, you should! In the Netflix film, a mysterious entity takes the form of people's worst fears and causes them to commit suicide. Basically, if you see it, you'll die. Malorie (Sandra Bullock) and her two children go through a dangerous journey to find shelter and a new community, and they have to complete the trip blindfolded. Admit it, you'll do everything for the moolah. Avoid stores at all costs! Remember your high school and college days? We gotta make Selena Gomez proud. Crushing on someone is hard, you guys. Yes, now everyone's paranoid AF! Who's ready for a game of palayok? We did NOT see this scene. "Cover your eyes, cover your eyes!"